During my time working for the Grapevine, it’s come to my attention that I’ve seen some fairly great movies, and have tried to review them accordingly; anyone who has been paying attention may note that I have yet to write a truly negative review, so lately I made an effort to find some films playing in theaters that would, perhaps, be more deserving of scorn. After watching two of cinema’s latest releases, I am dismayed, but happy, to say my search continues. 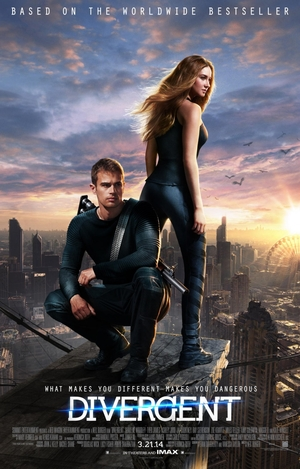 In Divergent, we are introduced to a dystopian Chicago, where the environment is destroyed, the buildings are crumbling from some unmentioned ancient conflict, and the citizens are unable to leave. So, it’s Chicago. It is never completely explained what horrific consequence led to the world as it is displayed here, but its not that important. In this world, as with high school, the citizens are split into factions, based on the philosophy that keeping people of separate temperaments separate will keep another cataclysm from occurring. There are the selfless ones, who live like Amish people and give most of what they have to the poor. There are the elitist smart ones who excel at science, the farmers who are happy and simple and have nothing to do with the plot, and the ones who become lawyers. If it sounds like I just described Hufflepuff, Ravenclaw, Slytherin, and District 13, it’s because I sort of did. Beatrice (Shailene Woodley), belongs to the selfless faction, but she wishes to join the Dauntless faction, a group of action-hero types who police the society. However, she very quickly learns that she is special, and does not fit into a category. This means she is “divergent”, an incredibly rare trait that may or may not be shared by the other main characters. This also means that the elitists in the smart faction, (including Kate Winslet, whose mind is clearly elsewhere) may or may not be trying to hunt her down, because people who think outside the box and cannot be sorted into factions are threatening to the social order in ways that are vague and nonsensical at first, but become more clear as the film goes on. One of the problems with the film is the fact that a lot of the characters in the Dauntless faction are incredibly unlikeable. The film, to its credit, doesn’t shy away from this fact, and presents “Triss” as a sort of counterbalance to what is quickly becoming a fascist endeavor. There’s a lot of young adult tropes present her, right down to Triss’s inevitable romance with the hunky “Four” (Theo James), but Woodley keeps the audience interested. Kind of like that one quiet girl in your high school who wants to join the Marines, you secretly really want her to succeed. That, plus some interesting sci-fi ideas keep this movie on a mostly interesting, emotionally (if not intellectually) mature level. It’s no Hunger Games, but for a date movie, or even an adaptation of a book, there’s much worse out there. In the Dauntless faction in Divergent, we are introduced to the subtle theme of how something once noble has become militant to the point that it now stands for something darker and more fascist. In Captain America: The Winter Soldier, the ninth (can you believe it) film from Marvel Entertainment, this theme is a lot more blunt. However, it’s also the smarter film of the two. Hell, it’s one of the smarter superhero films I’ve seen in a while. Picking up where 2012’s low-profile, little-movie-that-could Avengers left off, Winter Soldier finds Captain Steve Rogers (Chris Evans) struggling to find his place in the modern world after being quite literally on ice for nearly sixty years, only to be awoken to save the world from aliens. It takes a lot out of a guy. 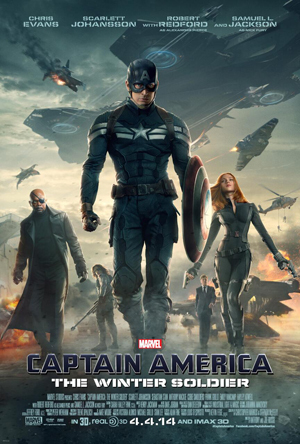 In the two years since we saw him last, Cap has been working alongside Nick Fury (Samuel L. Jackson) and Black Widow (Scarlett Johansson) as an agent of S.H.I.E.L.D., but things change drastically when Fury introduces Cap to Project Insight, a government program to spy on, and potentially eradicate, possible threats using those nifty helicarriers we saw in Avengers. Rogers is skeptical of the ethics of the program, as would anyone currently living in the current age of drones and heavy surveillance. , whose abilities in combat rival Cap’s. With no one to trust, and with S.H.I.E.L.D. senior Alexander Pierce (the legendary Robert Redford) hot on his trail, Cap has to find out the secrets of the organization before it’s too late. After that, it’s twist, after twist, after twist. Contrary to popular opinion., the film isn’t perfect. Some of these twists are fairly obvious, and the most surprising one, about S.H.I.E.L.D. is so shocking, it’s a little ludicrous. But hey, it’s a superhero film. But it’s, for the most part, such a clever and eerily relateable one, one tends to forget that fact. It also doesn’t hurt that the action scenes are some of the most thrilling I’ve seen in a film in a while. I wasn’t a huge fan of the first Captain America film; it was a little too campy and silly for my taste, but it has about as much in common with this film as Raiders of the Lost Ark has with The Bourne Ultimatum. I’m sure there’s a point to be made there about how cynical our attitude about patriotism has become, but if there is, the film was probably clever enough to include it. For a Captain America sequel, it’s incredibly bizarre, but for a superhero film in the era of Chris Nolan and the war on terror, it’s as fun as just about anything the series has included thus far, and is definitely worth a watch.